Watch for our announcement about accepting applications for the 2019 Island Sailing Club (ISC) scholarship. The Island Sailing Club Scholarship is a one-year membership to Island Sailing Club (ISC) provided by ISC and OWSA. This is a value of over $2600.00!! Each year, four OWSA members are awarded the scholarship, and share a club membership. Each scholarship recipient receives a Basic Sailing Class through ISC. 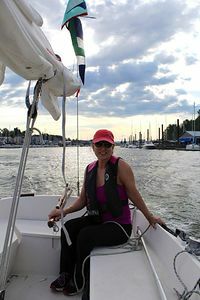 Members have access to ISC boats in Portland, Olympia, and Seattle (Kirkland). In addition, members receive discounts on additional classes. The Island Sailing Club scholarship gives OWSA members the opportunity to build sailing skills and confidence as a skipper. ISC members experience the decision-making process of planning outings, gathering crew, and choosing activities and/or destinations. We will not award the scholarship to an existing Island Sailing Club member. This year's application will be posted on this page once we start accepting applications. Contact Rear Commodore if you have questions.